Outstanding accommodation in a magnificent setting. B and B rooms plus a self catering cabin. Use the small wheel in the middle of your mouse to navigate the main area of this site. Unfortunately we do not accommodate children under 12 or accept pets. A private location boasting spectacular mountain views close to town. 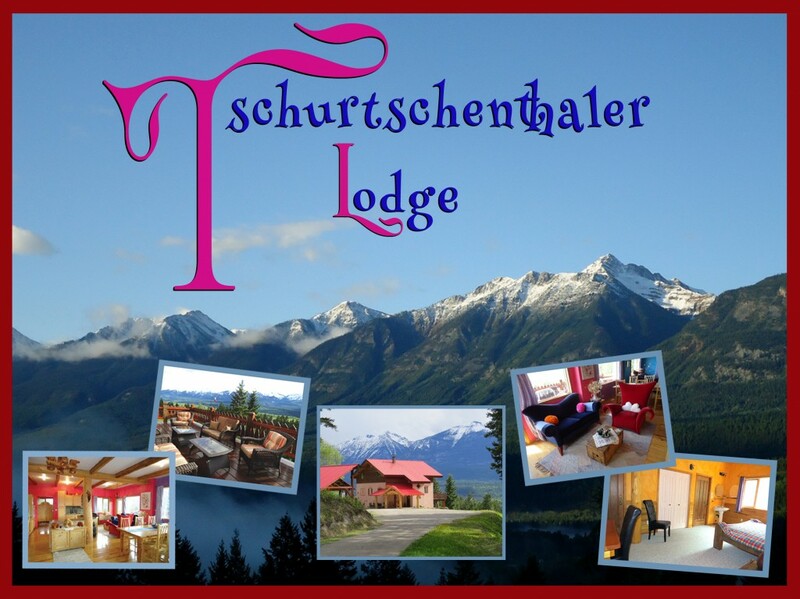 The lodge is located 6 Km south of downtown Golden BC and is set on a sunny hillside providing beautiful panoramic views of the Dogtooth and Purcell mountain ranges as well as the Columbia River and surrounding wetlands below. Enjoy nature’s beauty, curl up with a good book or take advantage of the large deck off the main area from which you can watch the Paragliders and Hanggliders flying by and keep a lookout for wandering wildlife. The lodge is non-smoking, but you may smoke outside and on the balconies. Click here to see a complete 360 panoramic view Courtesy of Darek Magusiac. See Photo Gallery for photos. Chose from four spacious guest rooms, with ensuite bathrooms and handcrafted timberframe beds. The two front facing rooms feature views of the mountains and valley, as well as sliding patio doors accessing balconies. The rear facing rooms have large windows, views of the grounds and forest as well as the morning sunshine. Room #1– Front facing, balcony with mountain view, queen bed, ensuite bathroom. Room #2– A larger room; front facing, balcony with mountain view, queen bed, sofa, ensuite bathroom. Room #3– A larger room; rear facing, forest view, queen bed, sofa, ensuite bathroom. Room #4– Rear facing, forest view, queen bed, ensuite bathroom. Our cabin is named The Snug, it is a private self catering cabin for two. If you are looking for a private mountain getaway where you can feel spoiled, completely relax but still be self-sufficient then this is it. Snuggle into the oversized queen bed, take in the view from the front deck while you plan each day’s activity, or relax with a glass of wine and keep a lookout for passing wildlife. Placed about 100 meters from the main house, it has a beautiful view, front deck, kitchen, full bath, bedroom and living/dining room area. There is a TV with built in DVD player and DVD library, wireless internet, but no actual TV. Turn off the Trans-Canada Highway into downtown Golden, this will automatically put you onto Highway 95 going South. Drive straight through town and approx 6 kilometers south of town you will see our blue lodging signs on the side of the highway. Turn left onto Almberg Rd. drive to the top of the hill and turn right down our driveway # 720. You can’t see the house from the road. If you are coming up Highway 95 going north, you will see the highway signs approx. 6 kilometers before Golden. Turn right onto Almberg Rd. drive to the top of the hill then turn right down our driveway. Altitude Adventures offers Tandem Paragliding from Mount Seven in Golden BC. To see what it is all about, watch their video below. For more information see the info and photo pages. Contact them at 250-439-9446 or email them.